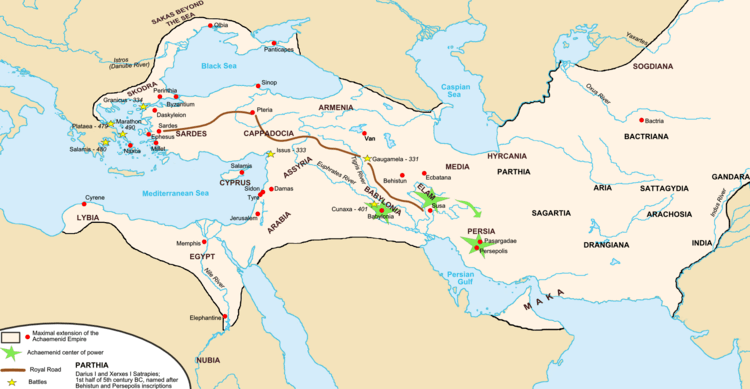 Map of the Persian Achaemenid Empire at its greatest extent under the reigns of Darius the Great and Xerxes. Inspired by Historical Atlas of Georges Duby (p.11, map D), this map was made by Fabienkhan the 24th of August 2006, using Inkscape and GIMP. Arad translated the map to help. These were the Iranian peoples. East of the Zagros Mountains, a high plateau stretches off towards India. While Egypt was rising up against the Hyksos, a wave of pastoral tribes from north of the Caspian Sea was drifting down into this area and across into India. By the time the Assyrians had built their new empire, a second wave had covered the whole stretch between the Zagros and the Hindu Kush. Some tribes settled, others retained their semi-nomadic lifestyle. These were the Iranian peoples. 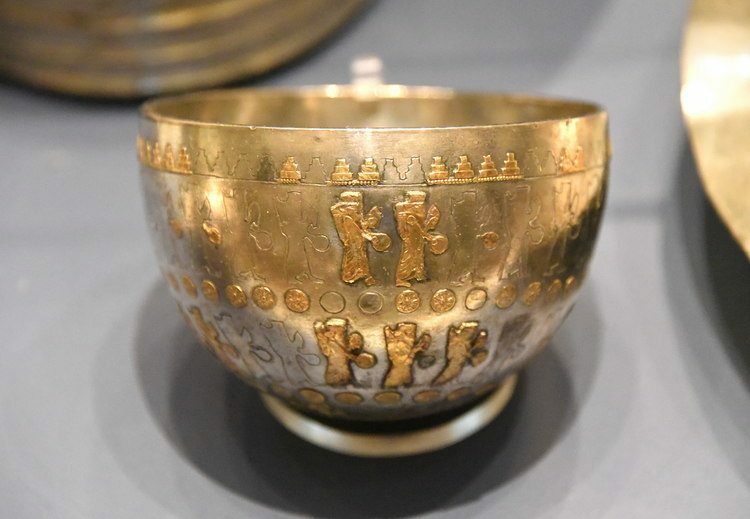 Like all nomadic peoples lacking police and law courts, a code of honour was central to the Iranian tribes, and their religious beliefs differed from those of farming people. Whereas the farmers of Egypt and Mesopotamia had converted nature gods into city guardians, the Iranians had begun distilling them into a few universal principles. Zoroaster, who lived some time around 1000 BCE, drove this process. For him, the only god was the creator, Ahura Mazda, bringer of asha – light, order, truth; the law or logic by which the world was structured. Even those who were not practising Zoroastrians grew up shaped by a culture that valued simple ethical ideas such as telling the truth. This article is an extract from the book Atlas of Empires, republished with permission. This book tells the story of how and why the great empires of history came into being, operated and ultimately declined, and discusses the future of the empire in today’s globalized world. In some areas, one tribe would manage to gather a collection of other tribes under its leadership. The Medes were one such. 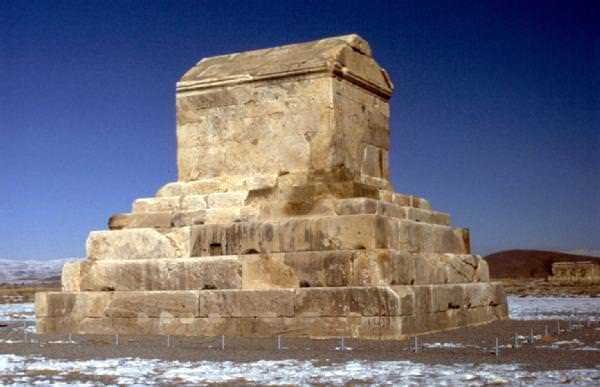 They built a capital at Ecbatana (‘meeting place’) in the eastern Zagros from where they extended their power. In 612 BCE, Cyaxares, King of the Medes, stormed Nineveh with the Chaldeans, after which he pushed into the north-west. In 585 BCE, the Medes were fighting the Lydians on the Halys river when a solar eclipse frightened both sides into making peace. Soon afterwards, Cyaxares died leaving an empire of sorts to his son Astyages (585–550 BCE). We are told that Cyrus was the grandson of Astyages on his mother’s side, but that did not stop him wanting to shake off the Median yoke. By 552 BCE, he had formed the Persian tribes into a federation and begun a series of uprisings. When the inevitable showdown with his grandfather came in 550 BCE, the Medes mutinied and joined Cyrus to march on Ecbatana. Cyrus took the title ‘Shah [‘King’] of Persia’ and built a capital on the site of his victory, which he called Pasargadae, after his tribe. Winning the Medes over had landed Cyrus with a vague, sprawling empire of countless different peoples, however. He faced cultural diversity, suspicion, and outright hostility. Lydia and Chaldean Babylon had agreements with the Medes; neither felt comfortable about a Persian takeover. Lydia was won because Cyrus did not play by the rules. After an indecisive battle near the Halys river one autumn, King Croesus (c. 560–c. 546 BCE) returned to Sardis, expecting to resume fighting in the spring according to custom. But Cyrus followed him home and captured Sardis itself, Lydia’s capital and richest of the Ionian cities. A century earlier, Lydia had minted the first coins, making Ionia a hub of commerce. Now all this fell to Cyrus. As for Croesus himself, it seems Cyrus may have spared his life, again against all precedent. Cyrus developed a reputation for sparing conquered rulers so he could ask their advice on how best to govern their lands. How much of this reputation was warranted is hard to know, but before Cyrus no one would have wanted it anyway; it would have been a sign of weakness. Cyrus, by contrast, saw cooperation as a strength, particularly when it came to securing the main prize: Babylon. Rather than trying to take the world’s greatest city by force, Cyrus fought a propaganda campaign to exploit the unpopularity of its king, Nabonidus. Babylon’s traditions would be safer with Cyrus, was the message. The gates were opened and palm fronds were laid before him as he entered the city. Once in Babylon, Cyrus performed the religious ceremonies Nabonidus had neglected and returned confiscated icons to their temples around the country. These acts enabled Cyrus to claim legitimate rule in Babylon; rule sanctioned by the Babylonian gods. He then explained what place this would take in his empire: his would be an empire based, in effect, on a kind of contract between himself and the various peoples in his care. They would pay their tribute and he would ensure all were free to worship their own gods and live according to their customs. The exiled Jews were allowed to go home and given money towards the building of a new temple in Jerusalem. This earned Cyrus a glowing write-up in the Old Testament as well as providing him with a useful buffer state against Egypt. Cyrus’s multiculturalism made an enduring imperial peace a real possibility at last and defined the way later empires sought to achieve stable rule. It was obvious to Cyrus that this was the only way he could hope to hold on to his conquests, but his was a vision only someone from outside the civilizations of the river valleys, with their intense attachments to local gods, could have conceived. Cyrus’s son and successor Cambyses II (529–522 BCE) added Egypt to the Persian Empire, but then a revolt broke out at home, led, it seems, by a Median priest posing as Cambyses’s brother, whom Cambyses had secretly murdered. Cambyses hurried back but died on the way, leaving one of his generals, a distant relative, to step in. His name was Darius. Darius I (‘the Great’) killed the pretender to the throne, but uprisings were now breaking out all over and he found himself having to re-establish Cyrus’s conquests. Backed by the army and the noble clans of Persia, grown rich from imperial rule, Darius regained the Empire and extended it into the Indus Valley, a prize worth several times more in tribute than Babylon. Darius realized that if the Empire were to work, it needed efficient organization. He divided it into 20 satrapies, or provinces, each paying a fixed rate of tribute to Persia. 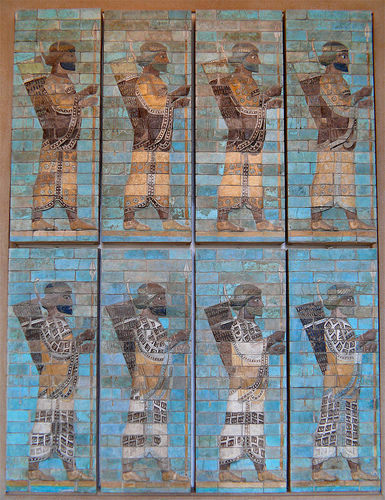 Each satrapy was run by a centrally appointed satrap, or governor, often related to Darius. To prevent the satrap building a power base, Darius appointed a separate military commander answerable only to him. Imperial spies known as the ‘king’s ears’ kept tabs on both and reported back to Darius through the postal service – the Empire was connected by a network of roads along which couriers could change horses at stations spaced a day’s travel apart. Darius took much of this structure from the Assyrians, simply applying it on a larger scale, but his use of tribute was something new. Previously, tribute had been essentially protection money paid to avoid trouble, but Darius treated it as tax. He used it to build a navy and embarked on massive public-spending programmes, pumping money into irrigation works, mineral exploration, roads, and a canal between the Nile and the Red Sea. He also established a common currency, which made working far from home much easier. 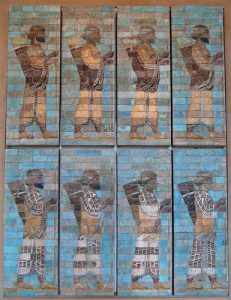 Darius now brought together teams of craftsmen from all over the Empire to build, under the direction of Persian architects, an imperial capital at Persepolis. Here he could keep his gold and silver in a giant vault (which soon became too small) and show off the multi-ethnic scope of his empire. Persepolis became a display case for the artistic styles of just about every culture within the Empire, held in a frame of Persian design. It was a visualization of Cyrus’s idea of empire. But Darius never acknowledged Cyrus. He seems to have had a chip on his shoulder about not belonging to Cyrus’s branch of the Achaemenid clan. As he outstripped Cyrus’s achievements, he began to carry himself in an ever more exalted manner, dropping the title Shah for the grander Shahanshah (‘King of Kings’). Like Persepolis, however, this followed directly from Cyrus’s vision. Cyrus had played the part of Babylon’s king when he entered the city, but his concept of empire demanded a ruler who stood above all kings linked to the interests of any one community. It required a king of kings. Darius’s later rule saw trouble in the Mediterranean. In 499 BCE there was a Greek revolt in Ionia. After eventually quashing it, Darius’s fleet sailed to punish Athens for backing the rebels, only to encounter a surprise defeat. If the Persian administrative machine were not to look dangerously weak, the Greeks would have to be taught a lesson. But when Darius raised taxes to fund a rearmament drive, he provoked unrest in more important areas such as Egypt. It fell to Darius’s son Xerxes I (486–465 BCE) to restore order in Egypt and take up the Greek question. Xerxes carried himself more loftily still than Darius and, with two great empire builders to follow, had even more to prove. But he lacked their cultural sensitivity. When tax increases produced riots in Babylon in 482 BCE, Xerxes sacked the city, destroyed the temple, and melted down the solid gold statue of Marduk, three times the size of a man. With it went Babylon’s greatness. Marduk’s gold allowed Xerxes to begin assembling his forces to crush the Greeks in 480 BCE. Forced into battle too soon, however, he suffered a worse humiliation than his father. After that, Xerxes seems largely to have withdrawn into the luxury of his court and harem. When Cyrus entered Babylon he had aped the behaviour of a Mesopotamian king for public consumption, but now the private lives of Persian rulers took Mesopotamian form. Shut up in opulent isolation, the later Achaemenids played out an increasingly gaudy pantomime of harem intrigue and palace assassination. The empire Cyrus and Darius had built was strong enough to weather this slide into decadence for 200 years, but gradually it took its toll. Satraps carved out their own islands of power. Inflation began to bite as taxes kept rising. Even the multiculturalism of the Empire, initially its great strength, had its drawbacks; the huge army was a bewildering ragbag of troops all trained and equipped according to their own traditions, all speaking different languages. 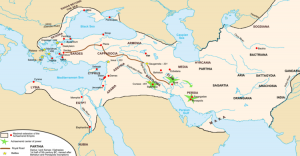 In 401 BCE, Cyrus the Younger, Satrap of Lydia, Phrygia, and Cappadocia, staged a coup against his brother Artaxerxes II (404–358 BCE) with the help of 10,000 Greek mercenaries who returned home when the coup failed. The information they brought back paved the way for the triumphant arrival of Alexander the Great in 334 BCE. Persia had been the first real empire, an empire with an organizational structure developed from a realistic idea of how to govern different subject peoples. It defined the role of an emperor and set a template for future empires from the Romans to the British. When Alexander came to replace the dying Persian Empire with a vision of his own, he held the example of Cyrus in the front of his mind.